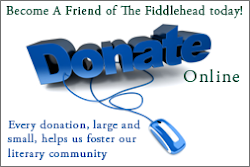 The Fiddlehead has a new website! Please join us there. We've launched the spring 2016 issue and The Fiddlehead's new website -- which includes all the information found on this blog and a whole lot more. As a result we will no longer be updating this blog. Congratulations to all of the finalists for the 2016 Griffin Poetry Prize! This year's international shortlist includes Norman Dubie's collection The Quotations of Bone. 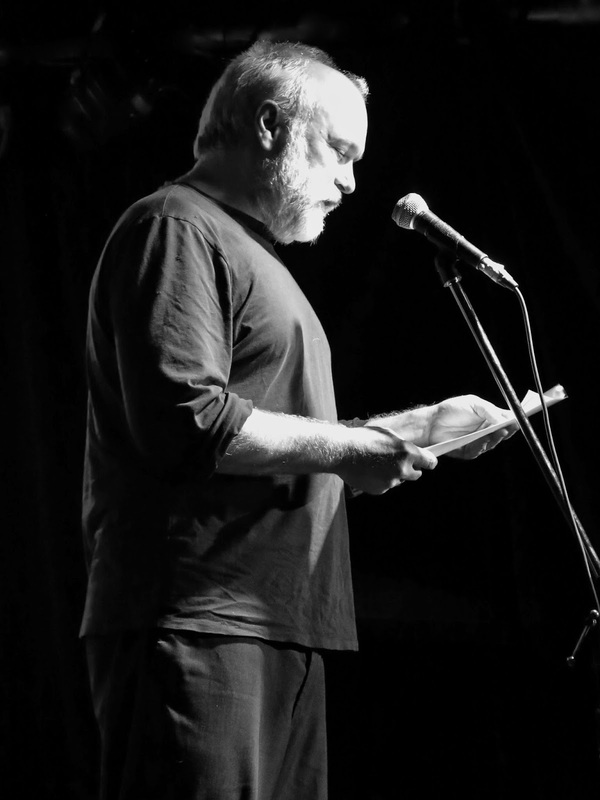 The Fiddlehead has published Dubie's poems on two previous occasions, in issues No. 241 (Autumn 2009) and No. 262 (Winter 2015), and those poems appear in The Quotations of Bone. 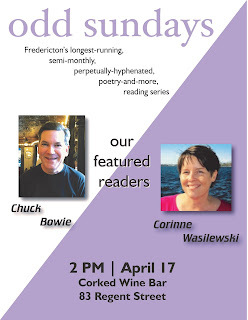 Get ready Fredericton for an onslaught of readings! First of all, Qwerty Reads happens tonight! See their Facebook event page. 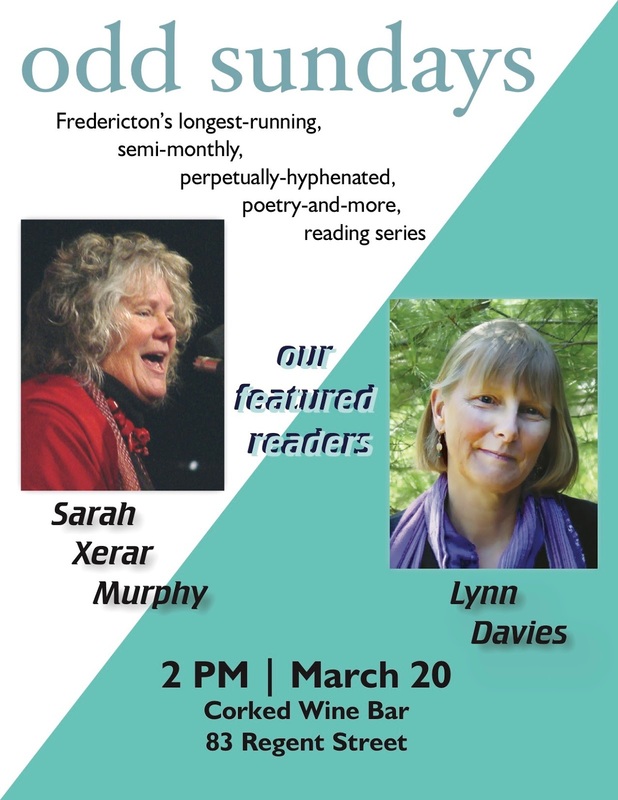 Qwerty Reads is a evening of poetry, storytelling, and live music celebrating the work of Qwerty Magazine, a literary journal run by UNB English grad students. This month's event, taking place April 14th at 7 PM at the Wilser's Room in the Capital Complex, will feature readings by Alex Carey, Katie Fewster-Yan and Steven Suntres, three of our outgoing MA students, who will be reading from their hot-off-the-press creative writing theses, as well as a poetry reading from UNB alumnus Jennifer Houle. The evening will also feature a performance from Marky Mark & the Jarmen (aka Marky Mark's Jamming Jarmen), a band containing UNB prof Mark Jarman, and a fun Q&A segment with Naomi Lewis, our outgoing writer-in-residence. The event is free and open to the public! 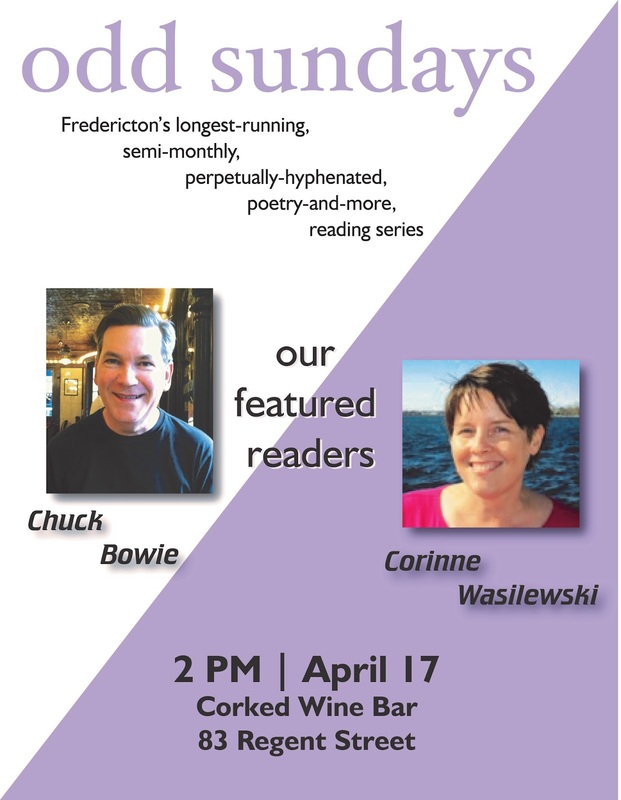 This Sunday, April 17 at 2pm, the odd sundays reading series features Corrine Wasilewski and Chuck Bowie. 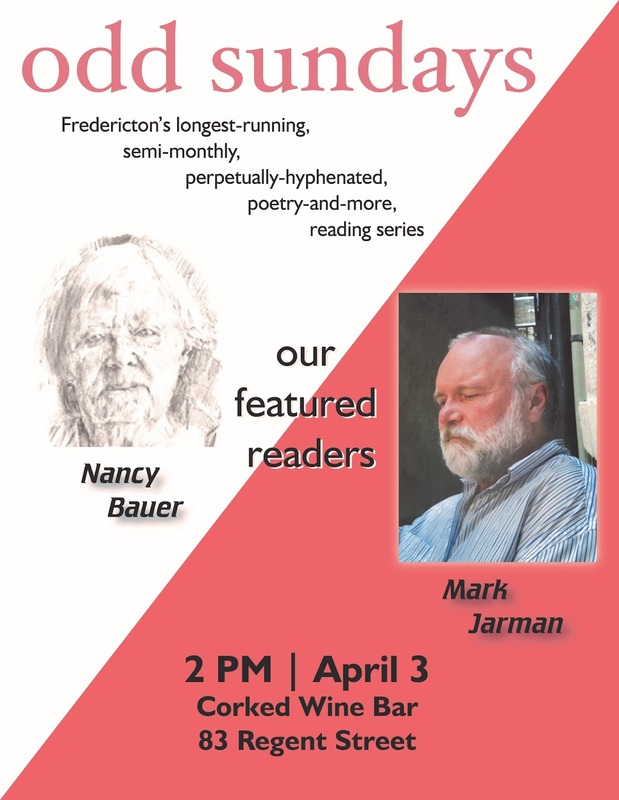 Gather once again at Corked Wine Bar, 83 Regent St., Fredericton for a great reading, an open set, and a free book draw! Corinne Wasilewski was born and raised in Woodstock, NB, but now makes her home in Sarnia, ON where she works as an occupational therapist. Her short stories have appeared in Front & Centre, The Windsor Review, The Nashwaak Review, and The Battered Suitcase. Live from the Underground is her first novel. An early version of the manuscript was awarded the WFNB’s David Adams Richards Prize in 2012. Chuck Bowie graduated from UNB with a BSc. His writing is influenced by the study of how people behave, habits he developed as his family moved nineteen times in his first twenty one years. Chuck is involved in music, supporting local musicians, occasionally playing with them. He is working through the fourth novel in the series: Donovan: Thief For Hire, titled The Body On The Underwater Road. Chuck and his wife Lois live in Fredericton. They have two adult musician sons. On Wednesday, April 20 at 7 PM at the Fredericton Public Library (12 Carleton St.), the CBC’s Jacques Poitras moderates a discussion with shortlisted authors David Sullivan (Boss Gibson: Lumber King of New Brunswick) and Thom Workman (The Servant State: Overseeing Capital Accumulation in Canada). Books will be for sale by Westminster Books. And on Thursday, April 21 at 7 PM at Westminster Books (445 King St, Fredericton), please join Ian LeTourneau, Fiddlehead poetry editor and City of Fredericton Cultural Laureate as he hosts an evening featuring readings by Phillip Crymble (Not Even Laughter) M. Travis Lane (Crossover) and Michael Pacey (Electric Affinities), all shortlisted for the New Brunswick Book Awards' Westminster Books Award for Poetry. This Sunday, April 3, the odd sundays reading series welcomes featured readers Nancy Bauer and Mark Anthony Jarman. odd sundays meets at Corked Wine Bar, 83 Regent Street at 2pm. As always, after the feature readers, there is an open mic and book draw. 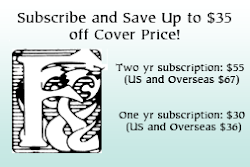 Nancy Bauer has published 5 novels, many short stories, and over 80 articles about arts, crafts, and books. She received the Alden Nowlan Excellence Award and a CBC Award for the Short Story. She co-founded the Maritime Writers’ Workshop, published 25 New Brunswick Chapbooks, and helped organize the Writers’ Federation of New Brunswick. Nancy is a charter member of Gallery Connexion, a member of the NB Arts Board and of several Canada Council juries. She was Writer in Residence at UNB and Bemidji State University. She has taught at UNB in various capacities and at writing workshops all over the Maritimes. For teh past nine years she has written a weekly column on the arts for the Telegraph-Journal. Mark Anthony Jarman’s latest work is a series of stories titled Knife Party at the Hotel Europa. 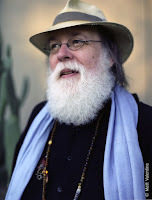 He is the author of five collections of short stories, a novel and a travel book. Mark has won numerous awards which include the Maclean-Hunter Endowment Award, the Jack Hodgins Fiction Prize, and he has been short-listed for the O. Henry Prize. He has published in The Walrus, The Barcelona Review, and The Globe & Mail, and many others. Mark is a graduate of the Iowa Writers’ Workshop, and now teaches at UNB, where he is fiction editor of The Fiddlehead. Fiction Editor Mark Jarman Nominated for Two Book Awards! Fiddlehead fiction editor Mark Anthony Jarman has been shortlisted for two book awards: the inaugural Alistair MacLeod Award for Short Fiction, handed out by The Atlantic Book Awards, and the New Brunswick Book Award for Fiction sponsored by Mrs. Dunster's and Fog Lit. The nominees for the 2016 Atlantic Book Awards were announced last night at a fundraiser at the Halifax Central Library. Included this year in the thirteen prize categories is a new award named for the late Alistair MacLeod. Endorsed by the MacLeod family, the Alistair MacLeod Award for Short Fiction honours the best short fiction from Atlantic Canadian authors. 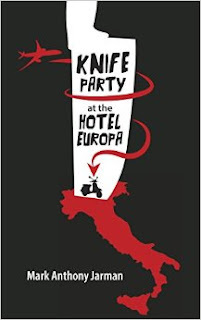 Three titles have been named to the shortlist, including Knife Party at the Hotel Europa by Mark Anthony Jarman. The New Brunswick Book Awards are also in their inaugural year, and have been organized by The Fiddlehead and the Writers' Federation of New Brunswick. This year's prizes recognize the best New Brunswick-authored books of 2015. Knife Party at the Hotel Europa is one of three nominees in the fiction category along with Beth Powning's A Measure of Light and R.W. Gray's Entropic. A vivid collection of short stories which circle and overlap in unexpected and delightful ways, Knife Party at the Hotel Europa transports readers to a version of sun-drenched Italy — a version of Italy as only one of Canada’s premiere short story writers could imagine it. 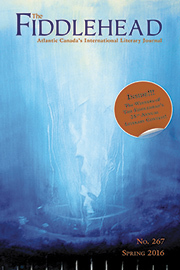 Widely hailed by both critics and readers, the book has helped cement Jarman’s reputation as one of Canada’s most accomplished masters of prose. 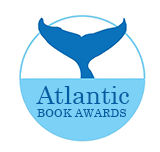 The 2016 Atlantic Book Awards and Festival runs April 20-27 with free literary events in all four provinces. Festival event details will be available at www.atlanticbookawards.ca soon. More details about the New Brunswick Book Awards can be found here. Winners of the 2016 Atlantic Book Awards and the 2015 New Brunswick Book Awards will be announced at a special awards show on the last night of the weeklong festival, Wednesday, April 27 at 7:00 p.m. at the Capitol Theatre in Moncton. The Canada Council for the Arts, the UNB Department of English, The Fiddlehead, and the UNB Bookstore are pleased to invite you to a reading by Giller Prize-winning writer Sean Michaels. 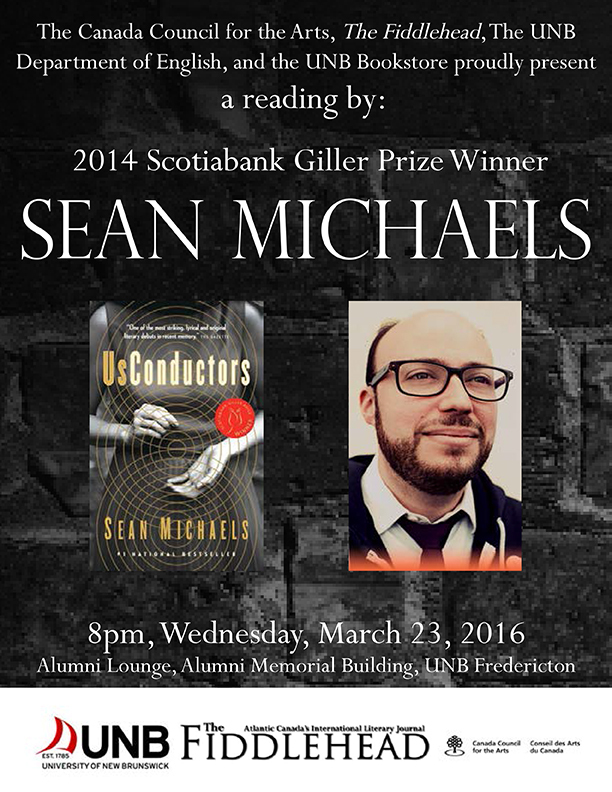 The event will take place at 8pm on Wednesday, March 23rd, 2016, at the Alumni Lounge, in the Alumni Memorial Building, on the UNB Fredericton campus. Winner of the 2014 Scotiabank Giller Prize, Sean Michaels’ Us Conductors is a beautiful, haunting novel inspired by the true life and loves of the famed Russian scientist, inventor, and spy Lev Termen, the creator of the theremin. Whisking us from the glamour of Jazz Age New York to the gulags and science prisons of the Soviet Union, it is a book of longing and electricity. This sublime debut inhabits the idea of invention on every level, no more so than in its depiction of Termen’s endless feelings for Clara — for what else is love, but the greatest invention of all?